It’s not hard to understand why many homeowners want a gazebo in their landscape. After all, it’s the most ideal place for various outdoor activities while being protected from the elements. A gazebo is a peaceful spot for reading or meditation, enjoying a family meal, or spending idle conversation with friends. Allow us to create this relaxing outdoor space for you by calling us at (614) 322-3333. If you hire us to build your dream gazebos, you’ll be getting the expertise of Ohio’s leading outdoor living specialist. We are based in Columbus, but we also serve clients from nearby cities, including Lewis Center, Reynoldsburg, Upper Arlington, and Grove City. Sometimes, it is daunting to decide which type and design of gazebos to choose for your outdoor area. You have to consider the style that fits the available space, architectural design of the main house, intended purpose, and your budget. Some designs are free-standing with open sides, and others are attached to walls or another structure. While there are a number of gazebo plans you can find online, it is still best to entrust everything to a professional company with qualified designers and skilled workers. We identify the right location. Gazebos can be situated near the edge or at the middle of a garden. However, we usually recommend building them in the center of the garden to create a more cohesive atmosphere. We do not build them under large trees to prevent the growth of moss due to absence of sunlight. There’s also the danger of falling branches and insect infestation that can cause damage to the structure. Our expert designers will help you choose the right spot in your landscape. We determine the size and shape. The key to building sturdy and functional gazebos is in proper planning. Before we start the project, we determine the right size and shape that will be perfect for the area. As a general rule, a 10-foot gazebo is enough for four people, while a 12-foot one can comfortably accommodate six individuals. 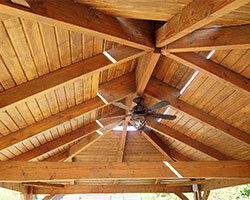 Although the shape is largely dictated by your home’s architectural style, we can still make customized designs. 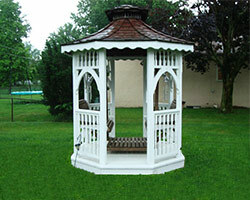 We can also create a six - or eight-sided gazebo, depending on your preferences and needs. We use only premium materials. Creative Earthscapes takes pride in using only properly treated wood, such as pine and red western cedar when building gazebos for our clients. This will not only provide aesthetic appeal to the gazebo but will also make the structure sturdy. We also ensure that the pavers and lighting fixtures we use are the best ones to avoid the need for frequent maintenance. You are also assured that other amenities that we will install for you are sourced from reliable suppliers. Our gazebos will not only beautify your outdoor area and make your garden stand out, but they will also improve your outdoor living experience. Let us create one for you by calling (614) 322-3333 now.